As you simplify life the laws of the universe will be simpler. Streamline your home environment. Reduce the amount of toys, books, and clutter—as well as the lights, sounds, and general sensory overload. Establish rhythms and rituals. Discover ways to ease daily tensions, create battle-free mealtimes and bedtimes, and tell if your child is overwhelmed. A manifesto for protecting the grace of childhood, Simplicity Parenting is an eloquent guide to bringing new rhythms to bear on the lifelong art of raising children (from inside cover of Simplicity Parenting). 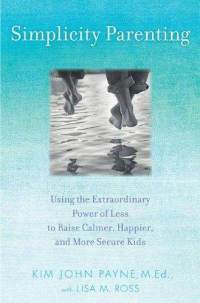 Simplicity Parenting, by Kim John Payne is a practical guide to "using the extraordinary power of less to raise calmer, happier, and more secure kids." My husband and I both read this book (read his review) and agree that simplifying our parenting according to these ideas would be worth a try. Before reading this book, I thought that the ideas would be a little too extreme for us (me) - but now I think implementing some of the ideas will be a pleasant change for our whole family. The author encourages parents to simplify the environment (reduce toys, books and clutter), develop routines and rituals, balance all the activity with down time (or "I'm bored time"), and to filter out unnecessary information (TV and topics that shouldn't concern children). In essence, by following these principles, we're allowing children to develop/unfold at their own pace, and as parents we're given the opportunity to savor their childhoods. I know we'll all be happier with less, plus it'll be easier to find the stuff we need!